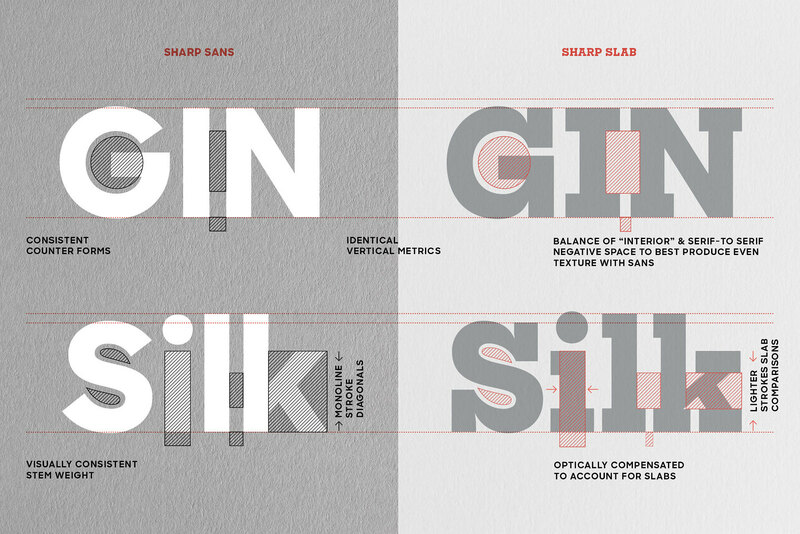 Sharp Slab is the Egyptian-slab serif companion to Sharp Sans. Drawn at the behest of campaign design director Jennifer Kinon, Shap Slab originated as a typographic palate expansion for the Hillary 2016 campaign. Sharp Slab served as a strong and approachable voice, delivering iconic slogans in crisp, ebullient typography. As the complimentary slab-serif to our flagship multipurpose geometric, Sharp Slab performs admirably at a range of optical sizes, from caption to display settings. Like its predecessor Sharp Sans, Sharp Slab is inspired in part by Herb Lubalin’s Avant Garde, and its sister Egyptian-slab-serif: Lubalin Graph. 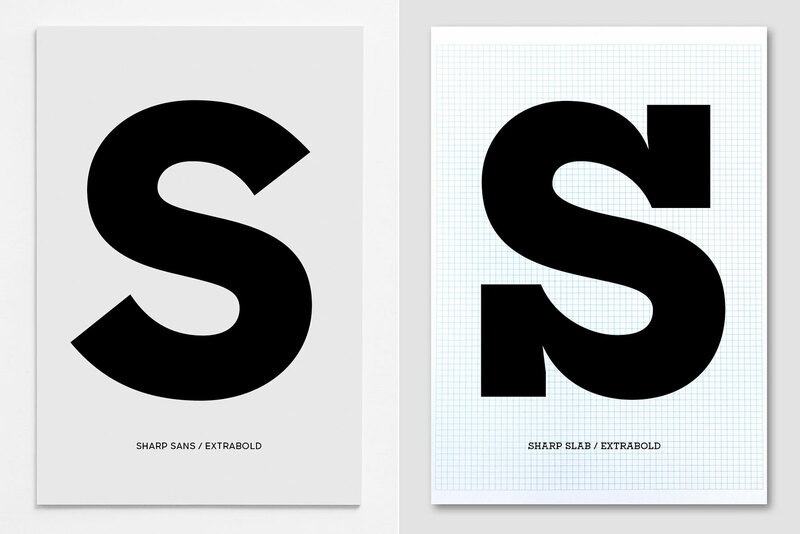 However, the Sharp Slab-Sharp Sans relationship differs from the Lubalin approach in some key respects. While Lubalin Graph tends to embrace the relentless mono-linearity of its sans counterpart Avant Garde, Sharp Slab carries significantly more optical compensation than Sharp Sans. Sharp Slab needed to function at the same relatively robust range of optical sizes as Sharp Sans, whilst maintaining an even texture across both families throughout this range. As a family made up of monolinear strokes, this was quite a challenge. The solution was exaggerated pinches at the terminals which increased its legibility at smaller sizes and also served to mitigate the increased density of texture that resulted from the addition of the thick slab-serifs. This feature originated as a technical adaptation, but became a fundamental aspect of its Joie de vivre. As the welling up of ink is only an issue in the darker weights, the lightest weights of Sharp Slab retain their nonlinearity almost entirely, giving the lighter end of the spectrum a distinctly modern feel. 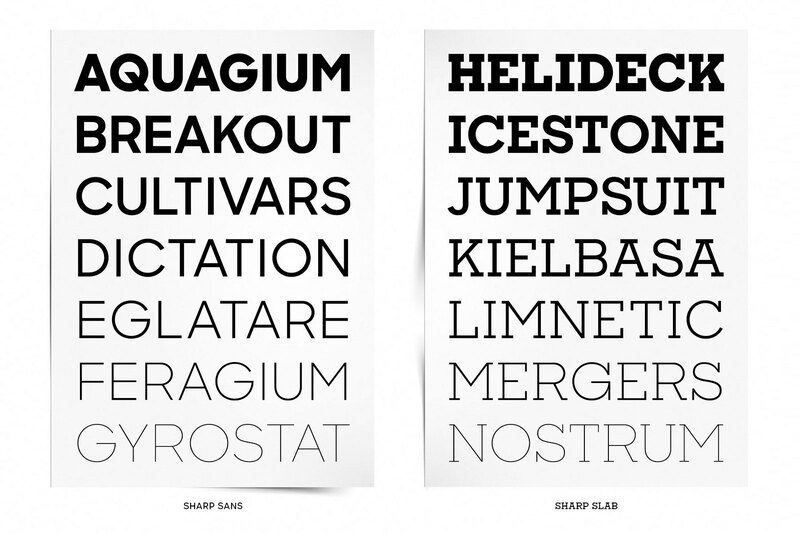 As a complimentary pair, Sharp Slab and Sharp Sans are both optimized for a diverse range of optical sizes, ideally above 16pt. Although the genre is most commonly used correctly as a display font, Sharp Slab also works surprisingly well in caption and even limited text settings, an uncommon characteristic for a geometric slab. As Sharp Slab was built from the monolinear geometric foundation of Sharp Sans, the two typefaces share some identical characters that did not necessitate the addition of serifs. The e for example, is identical between the two, as both a matter of practicality and concept. The same is true for the O, o, t, 6, 8, 9, and most of the punctuation. Designed by Lucas Sharp in 2018 with Connor Davenport. Special thanks to Jennifer Kinon.